I found this recipe in Cook’s Country magazine along with the goetta recipe. 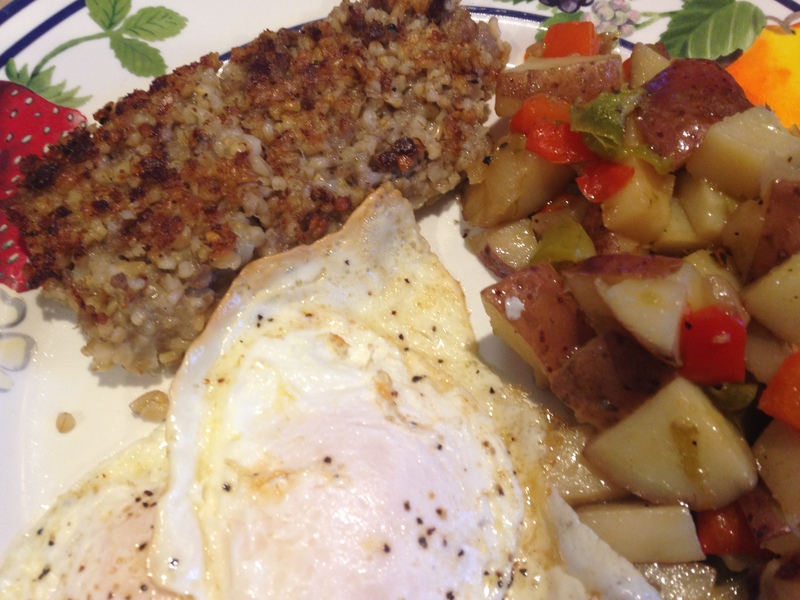 I made these potatoes along with the Goetta. I love potatoes. These were a simple and delicious recipe. Perfect with eggs and goetta! 2. Uncover and increase heat to medium heat. Cook, stirring occasionally, until liquid has evaporated and potatoes and bell peppers are spotty brown, about 12 minutes. (this took about 15 minutes) Season with salt and pepper to taste. Stir in scallions and serve. These potatoes will work for breakfast, lunch or dinner. You decide!! 1. Grease 8 1/2 by 4 1/2 inch nonstick loaf pan. Melt butter in Dutch oven over medium high heat. Add onion and cook until lightly browned, about 5 minutes. Stir in sage, fennel, and allspice and cook until fragrant, about 30 seconds. Add 4 1/4 cups water and sausage and mash with potato masher until water and sausage are fully combined. 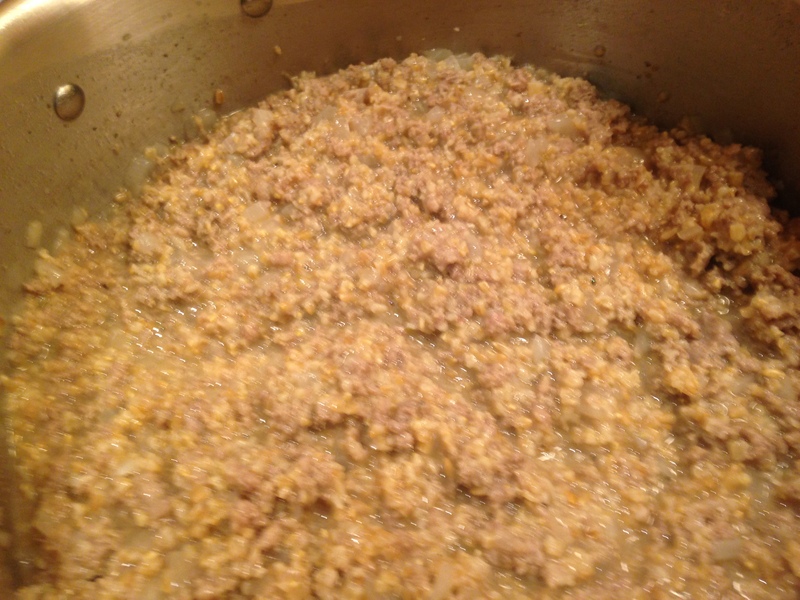 Bring to a boil and stir in oats. 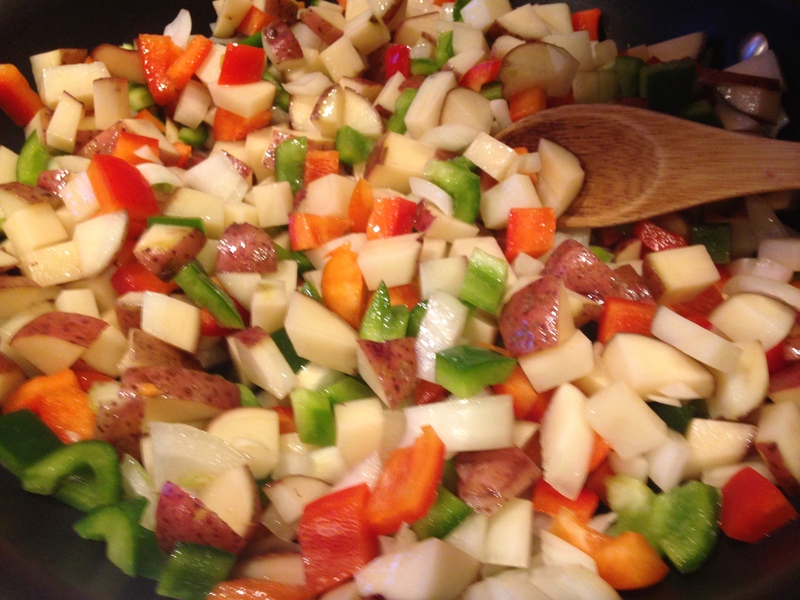 Cover, reduce heat to low, and simmer gently, stirring occasionally, for 15 minutes. 2. Uncover and maintain gentle simmer, stirring frequently, until mixture is very thick and rubber spatula dragged across bottom of pot leaves trail for about 3 seconds, 15-18 minutes. 5. 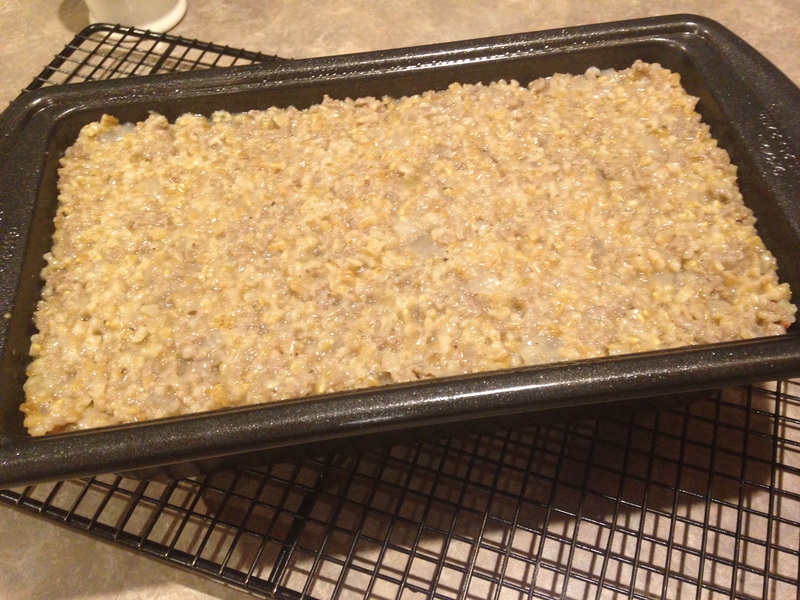 Wrap any remaining goetta in plastic wrap and refrigerate up to 3 days, or slice, wrap and freeze for up to 1 month. To cook from frozen, reduce heat to medium low and increase cooking time 7-9 minutes per side. We enjoyed this for breakfast. 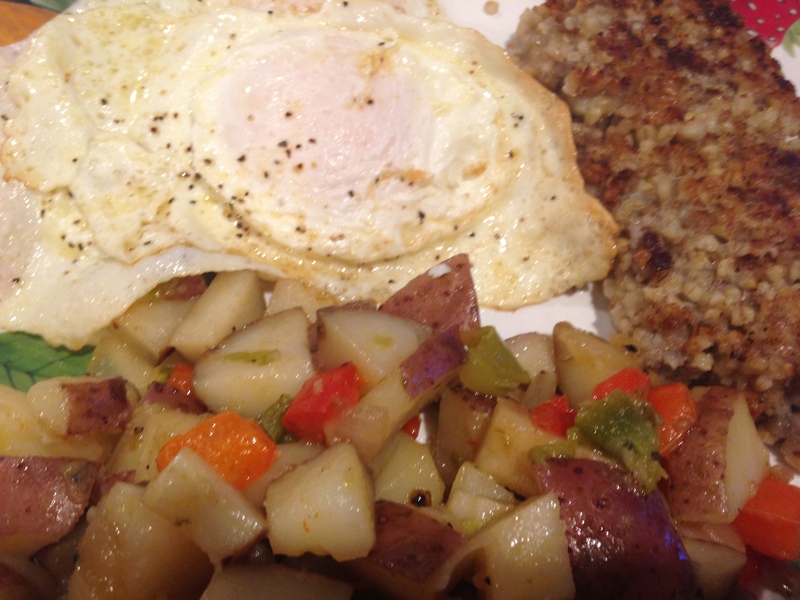 I served it with eggs and O’Brien potatoes. Give it a try. Always nice to try something new for breakfast or any meal for that matter!! Martin’s birthday is today. His request was for cheesecake with mango pudding and raspberries. Cheesecake is one thing I make quite frequently. 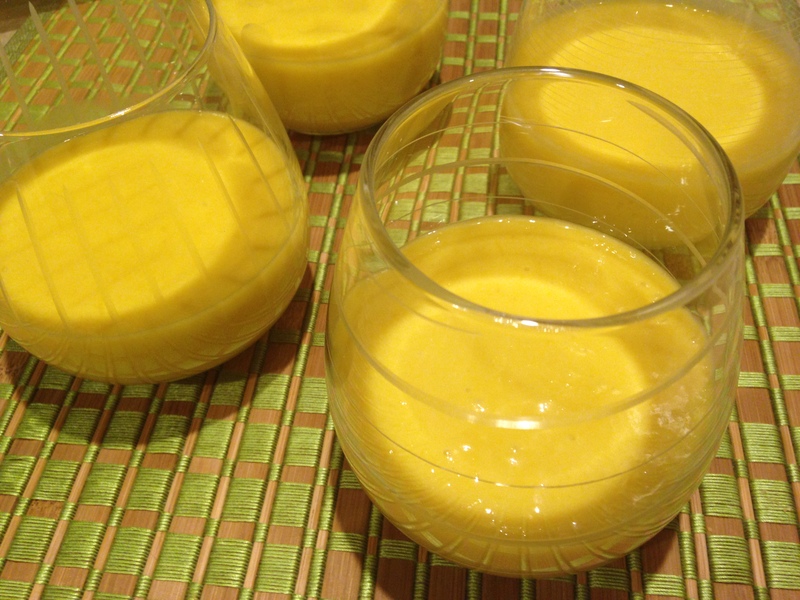 Mango pudding – never. I really wasn’t sure about this one. Martin sent me a recipe and I thought this is just too easy. I also wasn’t sure how mango pudding and cheesecake would taste together. 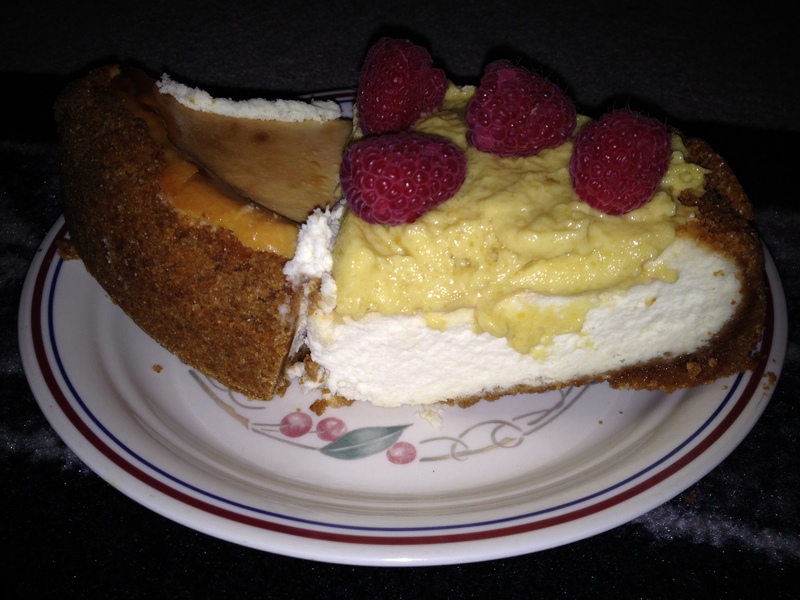 He wanted to use the pudding to put on top of the cheesecake along with fresh raspberries. He comes up with different flavors to blend together and I generally think he is crazy. Only problem is his ideas usually work quite well together. Go figure! Here is this simple and delicious recipe. 1. You mangoes should be ripe. I peeled the skin off and cut around the pit. Put the flesh in a food processor. Blend until pureed. 2. In saucepan, heat up water until it reaches a rolling boil. Take off heat and add the 3 teaspoons of gelatin. Constantly whisk so lumps do not form. Add the sugar and whisk until sugar is dissolved. 4. Pour into dessert bowls. Place in refrigerator until set. Takes about 1-2 hours. You can make a day ahead. After a delicious dinner at Nakashima’s, a sushi restaurant in town, we went to the Martin’s place for dessert. We had our cheesecake with mango pudding and raspberries tonight. It was quite delicious and the flavors went together perfectly! Happy Birthday Martin!! I have made this cheesecake for years. 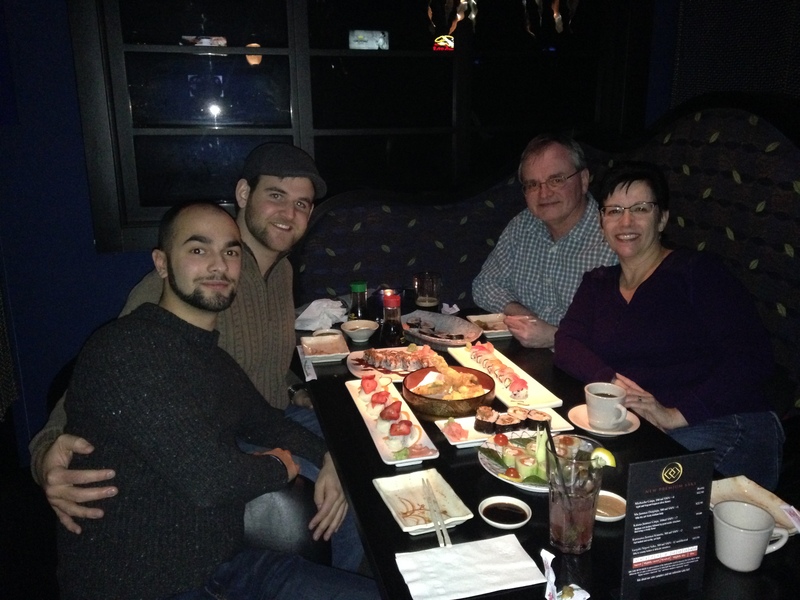 Everyone loves this cheesecake especially Kent (my hubby), and two of my sons Eric and Martin. Oh and me too 😉 Here is the recipe. Enjoy! 1. Preheat oven to 350 degrees. I use a springform pan for my cheesecakes. .
2. Mix graham cracker crumbs, butter (I only use butter) and 1/4 cup the sugar. Press firmly onto bottom and up the side of the pan. Put in 350 degree oven for 5 minutes. Take out to cool. 4. Add cold eggs one at a time, mixing on low speed after each addition just until blended. 5. Add sour cream and fold in to mixture with a spatula or wooden spoon. Pour into crust. 6. Bake 1 hour 10 minutes or until center is almost set. Turn off oven – Don’t try to make a shortcut and skip this step. Just saying 🙂 Leaving door slightly ajar, leave cheesecake in oven 1 hour. 7. Remove from oven; cool completely and the refrigerate for 4 hours or overnight. Remove from pan and top with your favorite topping. We like a plain cheesecake. 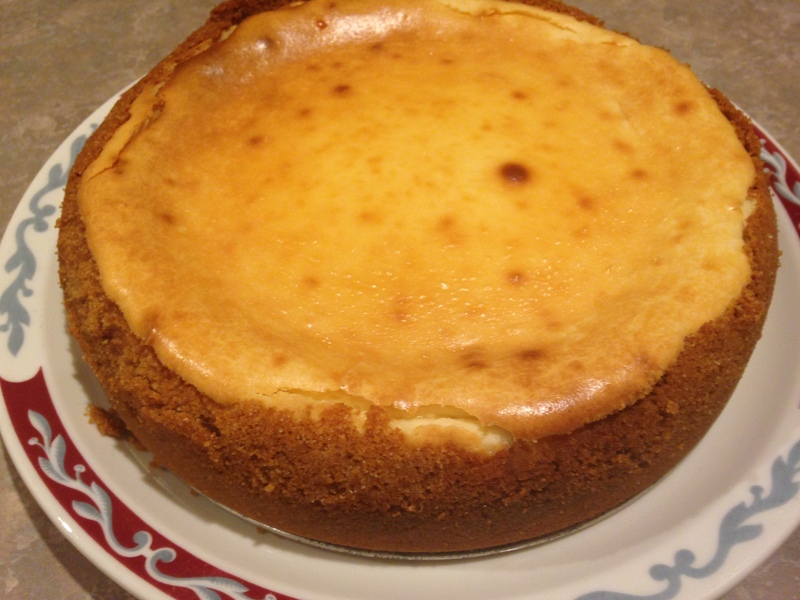 This cheesecake is simple, although it takes time, and extremely delicious.